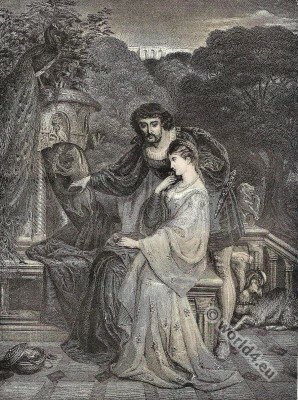 Lancelot and Elaine, The Lady of Shalott. Home » Lancelot and Elaine, The Lady of Shalott. Guarded the sacred shield of Lancelot. Of Lancelot, she that knew not even his name? Had named them, since a diamond was the prize. Alfred Tennyson, 1st Baron Tennyson (1809-1892) was an English poet of the Victorian era. His poems often thematized the English mythology (eg. The Arthurian legend in Idylls of the king 1859) and History (eg. The charge of the Light Brigade). They offered a wide variety of content templates for the Victorian art movements of the 19th century, such as the Aesthetic movement, the Arts and Crafts movement, which ended in Art Nouveau later, and the Pre-Raphaelite Brotherhood, especially themed The Lady of Shalott again. The Lady of Shalott is a ballad in four parts on the legendary figure of Elaine from the Arthurian romance, which Alfred Tennyson published in 1832 and revised for his poetry collection Poems of 1842. The theme of the poem has been interpreted many and has developed a strong effect in the visual arts as well as other authors. For the interpretation of the ballad, there are several approaches that relate to the position of the artist or the women in society. Lancelot (Launcelot or; French: Lancelot du Lac, English: Lancelot of the Lake, German: Sir Lancelot) is a legendary figure of the medieval Arthurian romances. His life was described differently depending on the narrator. Really important for the history of literature was created during the first third of the 13th century extensive Old French prose romances Lancelot en prose. This entry was posted in 19th Century, England, Genre, Romantic Era, Victorian period and tagged Character sketches, Romanticism fashion on 7/22/15 by world4.